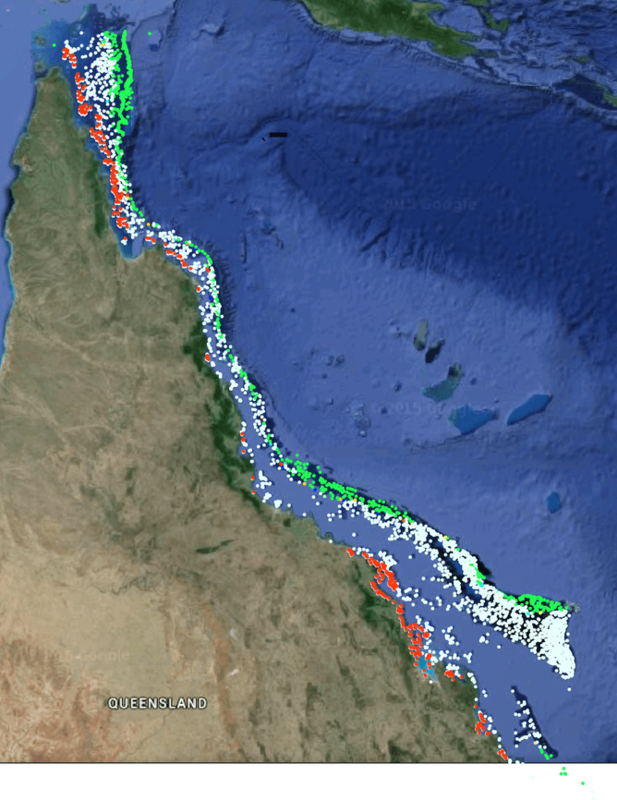 A new experiment on the Great Barrier Reef has shown, for the first time, that ocean acidification is already harming the growth of coral reefs in their natural setting. As our research published in Nature today shows, the reduction in seawater pH – caused by carbon dioxide from human activities such as burning fossil fuels – is making it more difficult for corals to build and maintain their skeletons. We and our colleagues, led by Rebecca Albright and Ken Calderia from the Carnegie Institution for Science in Stanford, California, carried out the first experimental manipulation of seawater chemistry in a natural coral reef ecosystem. Previous climate change studies on coral reefs have been done either in the laboratory or in closed-system tanks on the reef. One Tree Island forms a naturally isolated lagoon where pH levels can be manipulated. Coral reefs are particularly vulnerable to ocean acidification because calcium carbonate, the mineral building blocks of their skeletons, dissolves easily in acid. Below a certain pH, this dissolution is predicted to outweigh the accumulation of new calcium carbonate that allows reefs to grow and to recover from erosion processes such as storms. Previous studies have shown large-scale declines in coral reefs over recent decades. Rates of reef calcification were 40% lower in 2008-09 than in 1975-76. However, it was hard to pinpoint exactly how much of the decline was due to acidification, and how much was caused by other human-induced stresses such as ocean warming, pollution and overfishing. Understanding this is essential to predicting how coral reefs may fare in the face of continued global climate change. 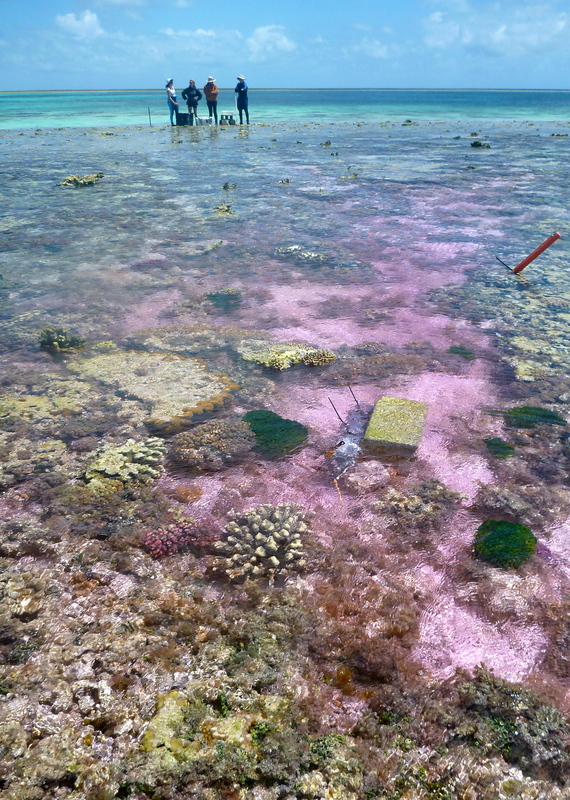 The study used pink dye to track the movement of the experimental seawater. To answer this question, we manipulated the pH of seawater flowing over a reef flat at One Tree Island in the southern Great Barrier Reef. By adding sodium hydroxide (an alkali), we brought the reef’s pH closer to levels estimated for pre-industrial times, based on estimates of atmospheric carbon dioxide from that era. In doing so, we pushed the reef “back in time”, to find out how fast it would have been growing before human-induced acidification began. It was clear from our results that reef calcification was around 7% higher under pre-industrial conditions than those experienced today. Most other ocean acidification experiments manipulate seawater conditions based on the low pH levels predicted for coming decades, to understand the potential effects of future ocean conditions. But we have shown that present-day conditions are already taking their toll on corals. Our work provides the first strong evidence from experiments on a natural ecosystem that ocean acidification is already causing reefs to grow more slowly than they did 100 years ago. Ocean acidification is already taking its toll on coral reef communities. This is no longer a fear for the future; it is the reality of today. With greenhouse gas emissions continuing to rise, our results suggest a bleak future for coral reefs over the coming decades, with reduced calcification and increased dissolution. This is particularly concerning in light of the major coral bleaching events observed globally over the past few years amid prolonged high sea surface temperatures. The mixed effects of ocean warming and acidification, as well as other human-induced and natural stressors, pose serious threats to the ecosystems we know today. 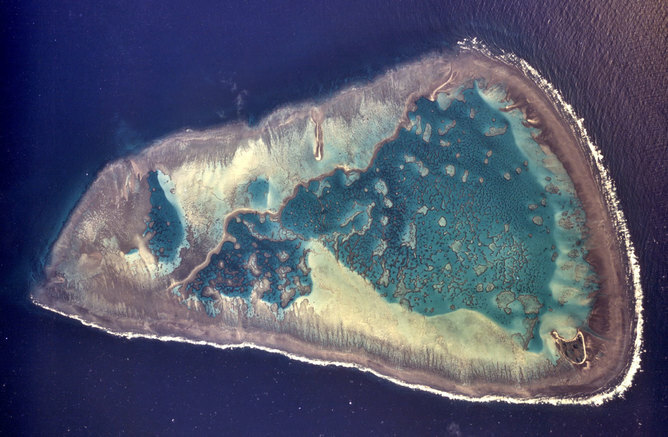 Increasing the alkalinity of ocean water around coral reefs has been proposed as a geoengineering measure to save shallow marine ecosystems. Our results suggest that this could be effective in isolated areas, but implementing such measures at large scales would be almost impossible. As our colleague Ken Caldeira has pointed out, the only real and lasting solution is to make deep, rapid cuts in our carbon dioxide emissions. Otherwise the next century could be one without coral reefs. Kennedy Wolfe will be online to answer questions about this research from 11.30 am to 12.30 pm AEDT on Thursday February 25. Leave your comments below. Our new research, published in Science Advances, now shows that young corals develop deformed and porous skeletons when they grow in more acidified waters, potentially making it more difficult for them to establish themselves on the reef and survive to adulthood. Corals vary in their responses to stress, not only between species and location, but also among different stages of their life cycle. Juvenile corals are extremely important to the health of a reef, as they help to replenish the reef’s coral population and also help it recover from severe disturbances such as bleaching and storms. However, newly settled young corals are small (typically about 1 mm across) and therefore very vulnerable to things like overgrowth and predation. To survive into adulthood they need to grow quickly out of this vulnerable size class. To do that they need to build a robust skeleton that can maintain its structural integrity during growth. Two major factors that affect coral skeletal growth are ocean temperature and carbon dioxide concentration. Both are on the rise as we continue to emit huge amounts of CO₂ into the atmosphere. Generally with adult corals, increased temperature and CO₂ both reduce growth rates. But this varies considerably depending on the species and the environmental conditions to which the coral has been exposed. Much less is known about the impacts of these factors on juvenile corals. This is mainly because their small size makes them more difficult to study, and they are only usually around once a year during the annual coral spawn. The corals we studied spawn for just a couple of hours, on one night of the year, meaning that our study hinged on taking samples during a crucial one-hour window. When collecting the samples, at Western Australia’s Basile Island in the Houtman Abrolhos archipelago in March 2013, we watched the adult spawners each night waiting to see if they would spawn and, when they did, we worked all night fertilising the eggs to collect our juvenile samples. Having collected our elusive coral samples, we cultured and grew newly settled coral recruits under temperature and CO₂ conditions that are expected to occur by the end of the century if no action is taken to curb the current trajectory of CO₂ emissions. We then used three-dimensional X-ray microscopy to look at how these conditions affect the structure of the skeleton. This technique involves taking many X-ray projection images of the sample (in this case around 3,200) and then reconstructing them into a 3D image. 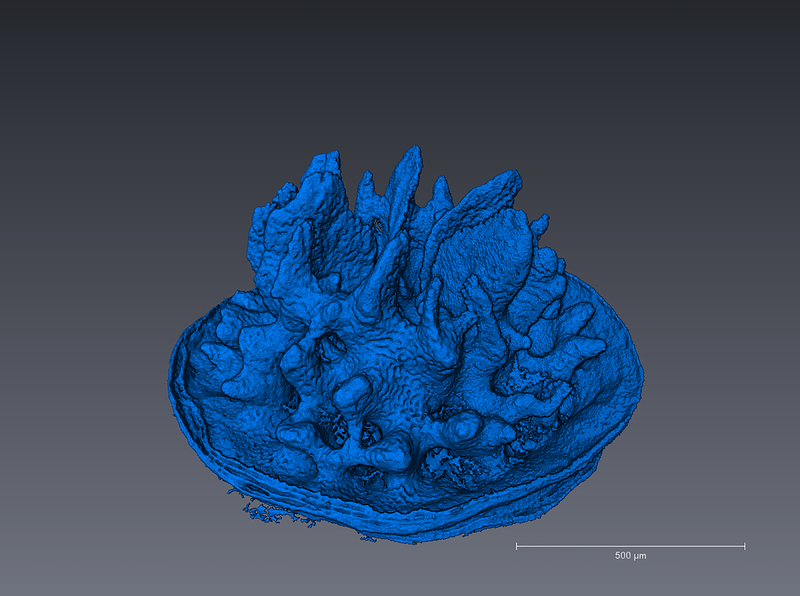 A 3D X-ray microscopy image of a one-month-old coral skeleton. Corals grown under high-CO₂ conditions not only showed reduced skeletal growth overall, but developed a range of skeletal deformities. These included reduced overall size, gaps, over- and under-sized structures, and in some cases, large sections of skeleton completely missing. We also saw deep pitting and fractures in the skeletons of corals grown under high CO₂, typical of skeletal dissolution and structural fragility. Surprisingly, increased temperature did not have a negative impact on skeletal growth and for some measures even appeared to help to offset the negative impacts of high CO₂ – a response we think may be unique to sub-tropical juveniles. Nevertheless, our study highlights the vulnerability of juvenile corals to ocean acidification. Under the current CO₂ emissions trajectory, our findings indicate that young corals will not be able to effectively build their skeletons. This could have wider implications for coral reef health, because without healthy new recruits, reefs will not replenish and will be less able to bounce back from disturbances. The effect of temperature in this study however, was both a surprising and welcome finding. There is a lot of variation even between species, but it is possible that subtropical organisms have more plasticity due to their natural exposure to a wider range of conditions. This could indicate that subtropical juveniles may have an unexpected edge when it comes to ocean warming. For most marine biologists, myself included, it wasn’t until 2005 that it dawned on us that a third of all human-caused carbon dioxide emissions are dissolving into and acidifying the sea. By driving down seawater pH (and increasing acidity), these emissions are increasingly bad news for marine organisms that build their protective shells and skeletons out of calcium carbonate. When seawater becomes too acidic, calcium carbonate structures begin to corrode, dissolving baby oysters, coral skeletons, and many other creatures. And while much has been written about the species that will lose out, a lot less has been said about the potential “winners” of ocean warming and acidification. In a recently published paper, we present evidence that the slimy, jelly-like creatures of the oceans are far more tolerant of rising marine carbon dioxide levels. It is these creatures that are likely to proliferate in a warmer and increasingly acidic ocean. Unfortunately for life in the sea, many of these lucky species are already considered a nuisance in marine ecosystems. There are places already on Earth that show us what the future might look like. The waters surrounding some coastal volcanoes are high in CO₂ and low in aragonite (a form of calcium carbonate). Testing the waters around volcanic seeps helps us understand the effects of ocean acidification on marine species. Volcanic activity causes CO₂ to bubble up (or “seep”) from the sea floor, acidifying large areas for hundreds of years. The tricky bit is finding carbon dioxide seeps without other minerals which confuse the story. But it can be done, and researchers have begun to study a number of these naturally acidified areas to understand which organisms thrive, and which are most vulnerable to ocean acidification. We have found that chronic exposure to increases in CO₂ alters food webs and causes marine biodiversity loss around underwater volcanic seeps in the Mediterranean, the Sea of Cortez, and off Papua New Guinea. Key groups, like corals and hard, skeleton-building algae, are consistently compromised and fish reproduction is disrupted. Meanwhile, higher CO₂ levels stimulate the growth of certain single-celled algae, seaweeds, and seagrasses. If temperatures remain low enough then the symbiotic algae of corals and anemones do well, as do numerous invasive species of animals and algae. Some organisms have tissues that protect their shells and skeletons – including some corals in the tropics, and mussels in temperate seas – meaning they can tolerate acidified seawater. Yet these animals, despite being tough, can still experience adverse effects on reproduction, behaviour, respiration, and growth when carbon dioxide levels ramp up. The fossil record serves as a warning. Shells found after high-CO₂ mass extinction events are much smaller than their ancestors — a phenomenon known as the Lilliput effect. Work at volcanic seeps has shown that smaller animals are better able to cope with the stress of ocean acidification. And while the carbon boost provided by ocean acidification can drive up phytoplankton productivity, it can also harm tropical coral reefs. A fall in carbonate levels causes coral skeletons to dissolve, and increased CO₂ levels stimulates the growth of seaweeds that smother the reefs. It is now clear that tropical coral reefs face a host of interconnected problems (bleaching, corrosion, disease, spreading seaweed, invasive species) that are all exacerbated by rising CO₂ levels. Invasive species of algae and jellyfish thrive at the levels of carbon dioxide that are predicted to occur this decade. Our review of laboratory experiments reveals stand-out cases such as so called “Killer algae” (Caulerpa taxifolia). This species, which benefits from higher CO₂, is spreading world-wide and is so toxic that native herbivores die of starvation rather than eat it. 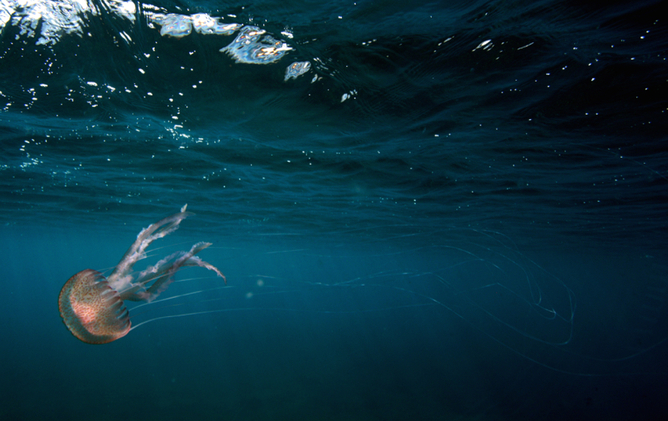 It turns out that loads of notorious nuisance species – such as Japanese kelp (Undaria pinnatifida) and stinging jellyfish (Pelagia noctiluca) — are resilient to rising CO₂ levels. Stinging jellyfish, like this one found near a CO₂ seep, might become an even bigger nuisance as the oceans continue to acidify. Global warming and changes in seawater chemistry may help the spread of hundreds of these damaging marine organisms. Ocean acidification research is the new kid on the block amongst planetary environmental issues. But as evidence rolls in from across the globe it is clear that many organisms are likely to be affected, resulting in both winners and losers. Both the decline of vulnerable species and the spread of harmful marine organisms should be factored into calculations of the risks of climate change and ocean acidification. If we want to curb the spread of harmful marine life, like toxic algae and stinging jellyfish, then reducing CO₂ emissions is definitely part of the solution. This is why there is a growing awareness of the central role of ocean issues in climate negotiations at COP21 in Paris and beyond. But local solutions to this global issue can also have a range of benefits. The International Union for the Conservation of Nature Blue Carbon initiative, for example, recognises the ability of coastal vegetation (e.g. saltmarshes and seagrasses) to prevent acid water run-off, and capture and store carbon – raising the pH of coastal waters. Other solutions include seaweed farming and the gradual restoration of mangroves in areas that have been converted to shrimp farms. To properly address the crisis of our warming and acidifying oceans, we must attack this issue from every angle. It’s time we began thinking about the ways we can more sustainably work with, and for, our oceans in order to preserve life on Earth. Ocean acidification – the rise in ocean acidity due to the increased absorption of carbon dioxide (CO₂) – is often thought of as consequence of climate change. However, it is actually a separate, albeit very closely-related problem. Ocean acidification is often referred to as “the other CO₂ problem” because, like climate change, it is primarily a result of the increased emissions of this gas. Despite their common driver, though, the processes and impacts of ocean acidification and climate change are distinct. It should not be assumed that policies intended to deal with the climate will simultaneously benefit the oceans. The current emphasis of global climate policies on a warming target is a case in point. A narrow focus on temperature stabilisation, for example, opens the door for policy interventions that prioritise the reduction of greenhouse gases other than carbon dioxide. This is because non-CO₂ greenhouse gases — like methane and nitrous oxide, which can arise from agricultural and industrial processes — typically have a higher global warming potential and might even be less costly than CO₂ to reduce. In addition, several geoengineering schemes have been proposed to reduce the impacts of a warming climate. Yet such schemes often do nothing to address emissions, and may even exacerbate carbon absorption in the oceans. The most important step in addressing both climate change and ocean acidification, and ultimately the only way to avoid the most serious impacts of both, is the reduction of carbon dioxide emissions. Long-term policy targets designed to guide emission reductions to a level that would avoid unacceptable consequences should consider both ocean acidification and climate change. Interestingly, it is in doing this that we see the solutions to these two global issues converge. Countries have largely agreed that there is a desire to limit global temperature increases to no more than 2℃ above pre-industrial temperatures. This is a desire that requires us to drastically reduce our carbon dioxide emissions. Indeed, the Intergovernmental Panel on Climate Change (IPCC) Fifth Assessment Report found that for a 66% chance of remaining below 2℃ we can emit less than 1,010 billion tonnes of carbon dioxide, or about one-third of our carbon budget. In fact, such a target is in line with the most ambitious atmospheric carbon concentration scenario (called RCP2.6) used by the IPCC to model climate impacts. A recent study in the journal Science conducted by J.P. Gattuso and colleagues modelled this same IPCC scenario and found that exceeding it would have wide-ranging consequences for marine life, marine ecosystems, and the goods and services they supply to humanity. However, as with climate change, many of the worst impacts of rising acidity could be avoided by following or remaining below this trajectory. The most critical feature of this scenario with regards to ocean acidification is a reduction of carbon dioxide to net zero emissions by no later than 2070. But, as Gattuso’s team importantly note, even achieving zero emissions within this timeframe would not prevent substantial ocean acidification. Coral reefs and shellfish populations will remain especially vulnerable. This is true for climate change impacts as well. And it is the reason that many, particularly those living in developing and low-lying island states, wish to see the long-term goal for global temperature rise reduced to 1.5℃. In effect, this means that reducing net carbon dioxide emissions to zero must happen even sooner than 2070. Ocean acidification, therefore, provides the impetus for additional urgency in agreeing to stringent timeframes for reducing CO₂ emissions. Net zero emissions on the table at Paris? We are fast approaching the next round of climate talks on the UN Framework Convention on Climate Change in Paris. If we are to see any meaningful global climate pact emerge, ocean acidification must sit firmly alongside climate change on the negotiation table. Given the double threat that ocean acidification and climate change poses to some of the most vital goods and services underpinning human welfare, including food security, economic development, and the viability of ecosystems, it is crucial that world leaders set sharp emission reductions square in their sights. Promisingly, up for negotiation in Paris is language that could see parties agreeing to net zero emissions. This would indeed be a very welcome, and ultimately necessary, development.